PureOS, a Free Software Foundation endorsed GNU distribution, is what Purism pre-installs on all Librem laptops (in addition to it being freely available for the public to run on their own compatible hardware or virtual machines). It comes with a GNOME desktop environment by default, and of course, since we love free ethical software, users can use KDE that is also available within PureOS. This is the future we will continue to advance across all our devices: a PureOS GNOME-first strategy, with other Desktop Environments (DEs), such as KDE, available and supported by Purism. At Purism we want a unified default desktop environment, and considering that we have chosen GNOME to be the default on laptops, we hope to extend GNOME to also be the default on phones. The ability for users to switch is also very powerful, and having a strong, usable, and supported alternative—that is, KDE/Plasma—for the Librem 5 offers the best of the “unified default” world and the “usable user choice” worlds. Purism has partnered with both GNOME and KDE for the Librem 5; what this means simply is that users running PureOS on their Librem 5 will get the choice of a GNOME environment or a KDE/Plasma environment, and the user could always switch between the two, like what is already the case on computers running PureOS. Will there be other partnerships in the future? We imagine so, since we will be happy to support any and all ethical OSes, GNU distributions, and want to make sure that the future is bright for a non-Android-non-iOS world. While the initial GNOME and KDE partnerships mean uplifting diversity at the top level (and greater choice for users), each have a slightly different developmental and support roadmap. The reason for this is pragmatic, since KDE is very far along with their “Plasma” mobile desktop environment, while GNOME is farther behind currently. Investing time and efforts to advance the status of mobile GNOME/GTK+, aligns with our longer-term goals of a unified default desktop environment for PureOS, offering a convenient default for users. Diversity is why we are supporting and developing both GNOME/GTK+ and KDE/Plasma. KDE: Purism is investing in hardware design, development kits, and supporting the KDE/Plasma community, and will be sharing all early documentation, hardware designs, and kernel development progress with the core KDE/Plasma developers and community. GNOME: Purism is investing the same in hardware design, development kits, and supporting the GNOME/GTK+ community as we are with the KDE/Plasma community. In addition, Purism is needing to lead some of the development within the GNOME community, since there is not a large community around an upstream-first GNOME/GTK+ for mobile yet. Choice is good, redundancy is good, but those are ideal when there is minimal additional investment required to accomplish technological parity. Since Purism uses GNOME as the default desktop environment within PureOS on our laptops, we figured we are going to invest some direct development efforts in GNOME/GTK+ for mobile to stay consistent across our default platforms. 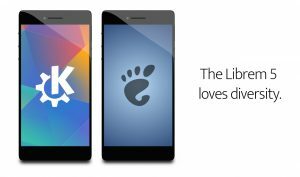 Adding KDE as a second desktop environment is directly aligned with our beliefs, and we are very excited to support KDE/Plasma on our Librem 5 phone as well as within PureOS for all our hardware. We will support additional efforts, if they align with our strict beliefs. Why not just use KDE/Plasma and call it a day? If we were doing short-term planning it would be easy to “just use Plasma” for the Librem 5, but that would undermine our long-term vision of having a consistent look/feel across all our devices, where GNOME/GTK+ is already the default and what we’ve invested in. Supporting both communities, while advancing GNOME/GTK+ on mobile to allow it to catch up, aligns perfectly with our short-term goals (offering Plasma on our Librem 5 hardware for early adopters who prefer this option), while meeting our long-term vision (offering a unified GNOME stack as our primary technological stack across all our hardware). It is also a good way to give back to a project that needs our help. Why not just push GNOME and GTK+ and forward? Because having an amazingly built Plasma offering available early to test and ship to users is a superb plan in many ways—not just for redundancy, but also because KDE/Plasma also aligns so well with our beliefs. The product readiness across these two desktop environments are so different it is not easy to compare side-by-side. Community support: by being involved in both communities, we are effectively doubling our efforts on supporting those communities, but that is a small cost for the greater benefit of users. Supporting both KDE/Plasma and GNOME means we will continue to build, support, and release software that works well for users across Purism hardware and within PureOS. Purism fully acknowledges that each platform is in different release states, and will be working with each community in the areas required—be that software development, hardware development kits donated, community outreach, conference sponsorship, speaking engagements, and offering product for key personnel. Update/P.S. : for the GNOME side of things, we are in close collaboration with upstream GNOME, and have followed GNOME Shell maintainers’ recommendations to have a simpler, Wayland-only shell (“phosh”) developed. You can learn more about it in our 2018 March 3rd technical report, in the “Compositor and Shell” section. So rest assured, those decisions have been taken with the “blessing” of upstream, based on purely technical grounds.